“Learning to live together, by developing an understanding of others and their history, traditions and spiritual values and, on this basis, creating a new spirit which […] would induce people to implement common projects or to manage the inevitable conflicts in an intelligent and peaceful way. Utopia, some might think, but it is a necessary Utopia, indeed a vital one if we are to escape from a dangerous cycle sustained by cynicism or by resignation.” This was the recommendation in the Report to UNESCO of the International Commission on Education for the Twenty-first Century – chaired in 1996 by Jacques Delors, former French Minister of Finance and President of the European Commission from 1985 to 1994. Artwork produced during a workshop by the Create Peace Project. The central theme of this issue of the Courier, commissioned and edited by Mary de Sousa (United Kingdom), approaches this question from several different angles. Can education really change lives? The response is ‘yes’, if we are to listen to Kailash Satyarthi (India), Nobel Peace Prize 2014 laureate, who has rescued over 85,000 Indian children from slavery, through education and employment. And how do we stop schools from becoming targets in times of war? Drawing on his experience in the field, journalist Brendan O’Malley (United Kingdom) offers some leads. Can peace be taught? The methods of the Nobel Peace Center in Oslo (Norway) provide an edifying example. Training for global citizenship? The innovative curricula of Harvard University, designed by the Venezuelan expert Fernando M. Reimers, prove that it is possible. Is the brain drain inevitable? According to Cameroonian specialist Luc Ngwé, it is possible to turn the situation around so that everyone benefits. Why is it essential that we restore the image of the social sciences and the humanities? Find answers in the article by Jean Winand, professor at the University of Liège, Belgium. In March, we celebrate the twentieth anniversary of the L'Oréal-UNESCO For Women in Science programme. Jean-Paul Agon (France), Chairman and Chief Executive Officer of L’Oréal, talks about the programme, which has supported 2,700 women researchers to date. 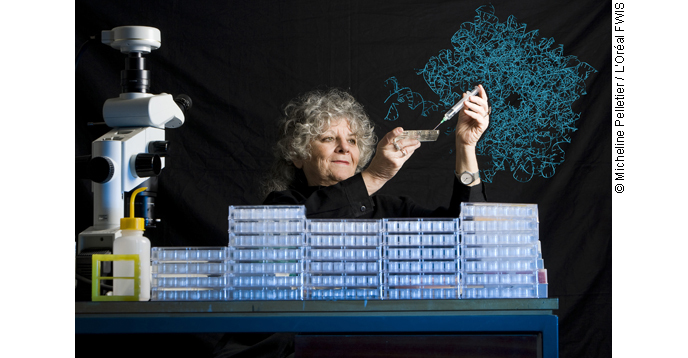 One of its 2008 laureates and winner of the 2009 Nobel Prize in Chemistry, crystallographer Ada E. Yonath (Israel), discusses her favourite topics in an interview. Professor Ada E. Yonath with dishes used for crystallization experiments. Two other remarkable women join us in this issue – the Sudanese-British TV personality Zeinab Badawi, who has recently adapted UNESCO’s General History of Africa into a nine-part series for the BBC, and Yemeni journalist and human rights activist Tawakkol Karman, who won the Nobel Peace Prize 2011. To close the pages devoted to International Women’s Day (8 March) in style, we invite you to China to discover the history of Nüshu – thought to be the only form of writing reserved exclusively for women. To mark International Holocaust Remembrance Day (27 January), the Courier revisits French lawyer and politician Robert Badinter’s 2016 speech at UNESCO on the theme of anti-Semitism throughout history. The author also pens an in-depth article on the subject, elaborating on significant lessons that can be learnt. In its 2018 edition, the United Nations World Water Development Report focuses on nature-based solutions. Linking with the report’s launch on World Water Day, 22 March, the Courier explores green bonds and the new scoring criteria for them, which could transform financial markets and boost investments in nature-based solutions. To end, the Courier takes you on an insider’s tour of radio stations in Mali, to commemorate World Radio Day (February 13). The UNESCO Courier celebrates its 70th anniversary this year. We invite you to discover the beginnings of this great adventure, through the eyes of Alan Tormaid Campbell (United Kingdom). African brain drain: is there an alternative?